Editing a Novel, featured on Penumbra zine Blog – Free! After my story, The Path of Nephthys, was featured by Penumbra zine, they asked me to write an entry for their blog. I wrote Editing a Novel which includes helpful links to free editing tools. Enjoy! “Alice and The Maze” is available! I’ve decided to start publishing some other things while working on a sequel to The Harmony of Isis. Did you ever wonder if Alice had any other adventures? Follow her as she discovers the strange world of The Maze! I have entered NYC Midnight Flash fiction competition. I’ll find out in October if I move on to the next round! In this contest, you are given parameters to write a story of 1000 words. Mine were: Genre: Romance; Location: A post office; Object: An ashtray. It’s a difficult contest, because you have only two days to think of a story involving your prompts and then write it in time to upload it before the deadline. I am always uploading at the very last minute! In a new town, Sarah learns that gifts can come from unexpected directions. “I’m heading out to the post office!” Sarah called. “You got it.” On her way through the shop, Sarah adjusted the angle of a 19th-century, marble ashtray, and then paused in front of a mirror to check her hair and teeth. “Umm, hmmm?” Harry made a caught-ya face. Sarah grinned and stuck her tongue out before leaving. A bell over the door rang when the door opened and shut. Harry was great. Sarah was glad he answered her Help Wanted sign a few weeks earlier. Already, she didn’t know how she got everything done before he got there. She walked down Main Street to the post office. Living in Fairview, with its one street of businesses, was a big change from her old routine in New York City. She was still getting used to people in town knowing her name. Inside the small building, the air held that odd stillness unique to post offices. Though he was helping Mr. Bentley, Jeff glanced at her from behind the counter. Sarah melted inside at the sight of his deep brown eyes and they both smiled. She got on line and chatted with Mrs. Rodgers in front of her until it was her turn. Her stomach filled with butterflies. “Morning, Sarah,” Jeff said, his deep voice sending a tingling wave through her. “Oh, yes, it came in late yesterday afternoon.” He got up and walked to the back. Sarah watched his powerful frame and swallowed. On his return, they held each other’s eyes during his whole walk back. “No … no, thanks, Jeff.” She blushed and smiled. Walking away and reading the return address, she frowned a bit in confusion. It’s from a post office box right here in town? Whoever sent it could have just as easily brought it to her store. She turned to ask Jeff if he knew who sent it, but he was busy. “I guess so!” She put it on and looked down at the shiny pendant resting in her slight cleavage. “Wow! It’s the perfect length!” Harry smiled and went back to work. Sarah put the phone down, her other hand absently playing with the necklace. Each day that week, a new package notice came. She grew more excited with each gift, and called Harry over to watch her open them. “But why doesn’t he say anything when I pick them up?” she asked him. On Saturday, a half-hour before the post office closed, she went to see Jeff. She dressed carefully, and wore the necklace, earrings, bracelets and pin. She even wore lipstick. The line was much longer, and by the time Sarah got to the window, it was closing time, like she planned. “Did I what?” his eyes crinkled with his smile. His phone beeped and he glanced down. Sarah watched his features soften as he read the message and she saw a woman’s face above the text. It’s not him! Her heart sank. “Oh, um, did you get any stamps with trees on them? Sarah paid and left as quickly as possible, glad she hadn’t said anything embarrassing. Walking back to her store, she blinked tears back. I always seem to like the unavailable ones. “No one?” He asked, leaning against the wall. “It’s you, isn’t it?” She smiled back. He came over to her. It seemed to Sarah as if he walked a long time, from a far distance, and then he was there, in front of her. “It’s me,” he said, and took her in his arms. 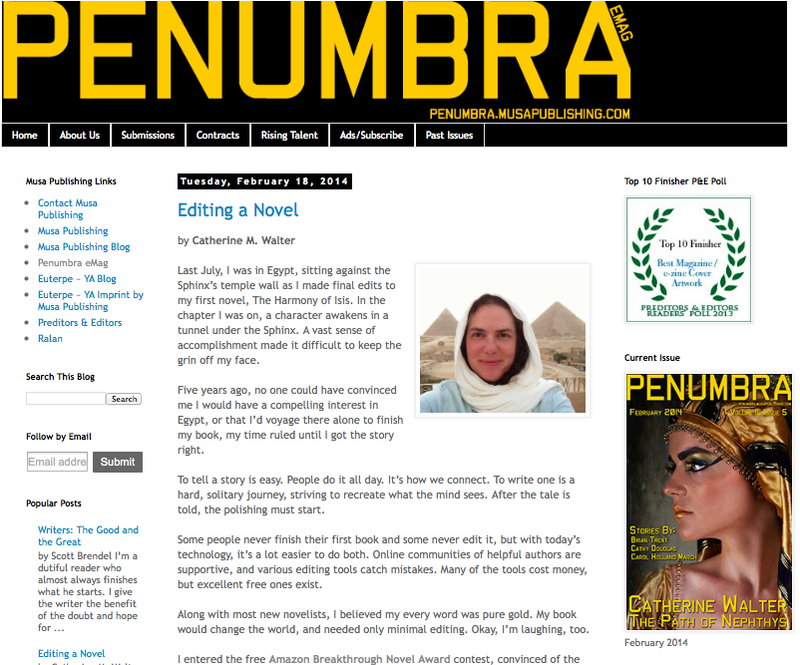 http://penumbraezine.blogspot.com/2014/02/editing-novel.html Penumbra Features a Blog Post by Me! My blog post, Editing a Novel, is featured at Penumbra ezine. 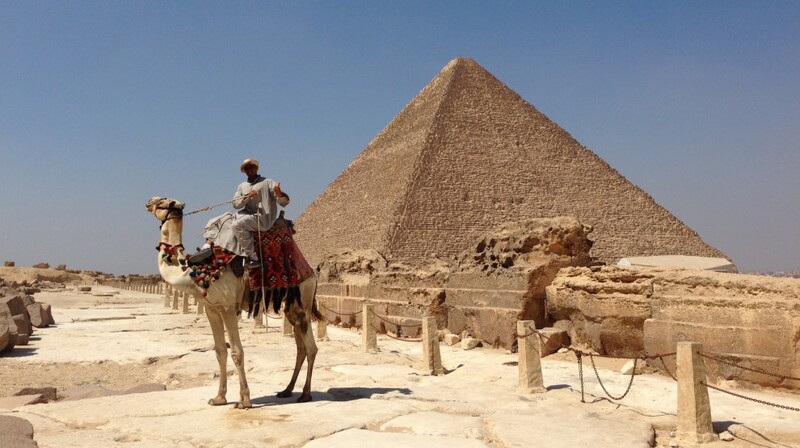 It describes how I edited my novel, The Harmony of Isis, the process culminating in a wild, solo trip to the Great Pyramids. A short story I wrote, The Path of Nephthys, is the featured story in Penumbra’s Egyptian Mythology Issue!